Could a Vernon Reid model be made minus the MIDI? I love the VR feature set (HSS FR V neck) but I have no use for the MIDI capability. Would it still be considered a VR model? Re: Could a Vernon Reid model be made minus the MIDI? It's been shown here recently that you can have anything made by the factory if you're willing to wait for it. If it matters what name might be stenciled on it (does it really?) I suppose you could even have it called a Vernon Reid something-or-other. It doesn't really matter, but I'm just curious what Parker's policy is about that. Being very special and expensive I would say signature models like Vernon's or Adrian's are not made or sold in very high quantities. I would guess they have a few of them and they're shipped to dealers as requested, then they make a few new ones. So it shouldn't be too much of a problem to have your local music store contact Parker and ask them to omit the MIDI on one of the guitars in the next production run. Then again... I've never played a MIDI and I don't know if I would use it on a regularly basis. But I wouldn't mind having one, if only for the chance to try it and discover its wonders and maybe get lost in it and devote future funds to synth gear, who knows. Once you start down the midi road, you either realize how much MORE of your time and skills you will have to apply and run away quick, or you dive in and get lost in the possibilities. I know Vernon plays a lot of stuff and has many different genres to explore, but I always thought he had that thrown in on his model as a lark. Sort of a "Why not?" extra. Now a few years later, I can't stand a guitar that I can't plug a 13-pin cable into. I think the features, minus the paint job, without midi, from Parker would be a much cheaper guitar. Who at Parker would I contact to ask about this? Well I got my answer. I called up Parker today. The guy who helped me (his name unfortunately escapes me at the moment) was extremely nice and told me exactly what I had to do to process my request. 2. And having that person help me! Nice! Are you going to have one made? Could you hit that thing a little louder, please? I'm still waiting to hear how much it'll cost before I decide anything. While I'm on the subject, had anybody seen the color African Violet in person? I've never seen African violet, but now I want one. 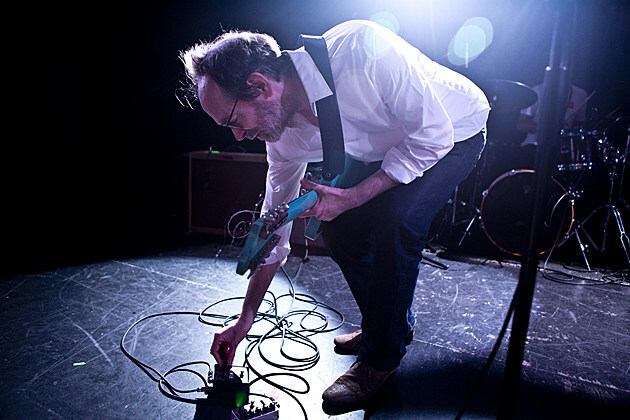 I was wrong in my assumption about Vernon's use of the midi pickups. He posted last week on the vguitar forums that the vg99 is still the "brain" of his setup. 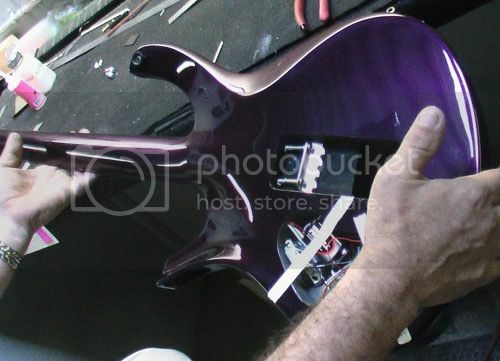 I sure wish they had more pics of the completed guitar. That is a cool color! Well for anybody else who's interested I heard back from Parker. A custom VR minus midi is the same cost as the production VR. The costs obviously offset. Oh well.